"Around this highland village Nature has formed numerous terraces, some having their sides variegated with flowering shrubs, and others deeply shaded with the rich foliage of trees of stately growth. As seen from the Tulloch Hill, the view which rises before the eye of the spectator is both rich and grand. 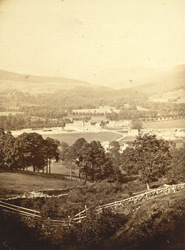 In the background, looking up Glen-Tilt, appears the vast outline of the mountain peaks, whose dreary heights exalt the picturesque beauties of the landscape, and enhance the appearance of the subjacent valley. The village is situated upon a rising ground which overlooks a fine plain at the junction of the Tilt and Garry, and is now fast rising into importance, having a spacious Hotel for the accomodation of visitors, and communicating both north and south by the Highland Railway. The drive between Dunkeld and Blair Athole is not surpassed in beauty by any other 20 miles of railway in the kingdom."